Note: This post was first published on June 4, 2009. It was updated (last time in February 2016) to reflect the changes over the time. In June 2009, the world was a bit different. Steve Jobs was about to present iPhone 3GS with iOS 2.0, Windows 7 was just around the corner and VMware released ESX/ESXi 4.0. With this release, VMware updated its licensing policy and asked its partners to follow these changes accordingly. Thus, starting from Veeam Backup & Replication 3.1 and free ESXi 4.0, these 2 products and their new versions don’t work together. Fast forward to 2016: Even though the world has changed a lot — for example, ESX was discontinued in favor of ESXi — the situation remains the same and the latest Veeam Backup & Replication v9 doesn’t support free ESXi 6.0 environment. In the article below, I will explain from the technical point of view why it occurred that way and what can be done if you happened to use free ESXi. In order to overcome the limitations of traditional (physical) backup policies and legacy approaches, VMware used a VMware Consolidated Backup (VCB) in ESX/ESXi prior to version 4.0. VCB was a module that ran on a dedicated proxy backup server, gathered snapshots of each VM’s disk image and backed them up by itself. The VCB feature was a step forward toward simplicity compared to traditional backups. However, in addition to requiring a separate server (the proxy), it had some limitations, including the absence of incremental backups and the temporarily doubled I/O load on production storage. Starting with ESX/ESXi 4.0, VMware replaced its VCB technology with innovative VMware vSphere Storage APIs (VADP) along with the Change Block Tracking (CBT) mechanism. VADP was next generation of VMware’s data protection framework and extremely useful for backup utilities. Using VADP, the backup application triggers the API to kick off the snapshot process and then backs up the resulting data set by mounting the snapshot and storing the data in a backup file. This provides an easy way for the backup software to take image-level backups of VMs directly. On the other hand, CBT allows applications to get a list of blocks that have changed since the last backup point (or time point in the past) and makes subsequent backups using the changed data only. This obviously requires less time and space for incremental files. 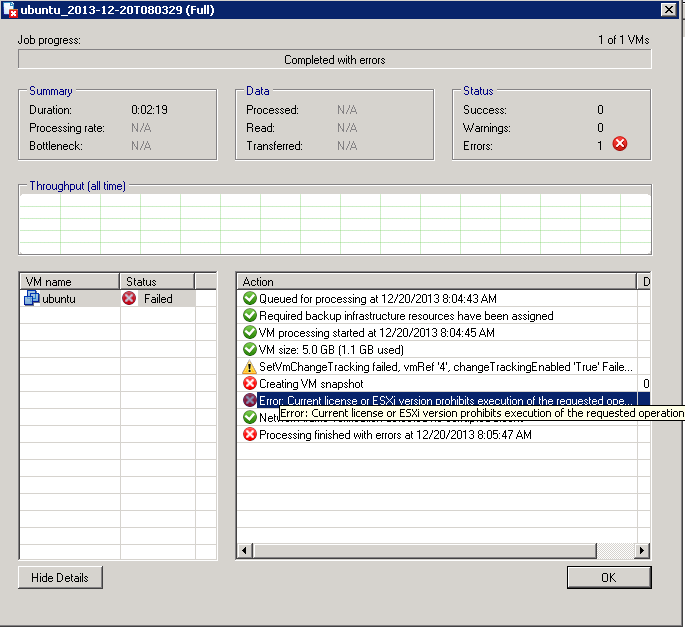 Another great and important feature of ESX/ESXi 4.0 is called Hot-Add. This mechanism adds disks on the fly from one VM to another. It allows users to copy data directly from one disk to another without using network stack, which significantly reduces network traffic and time needed for the process. Backup and recovery products can offload specific VM and storage management operations to compliant storage hardware so the host executes these operations faster and consumes fewer resources. With these advancements, backup solutions were able to perform their operations much faster, substantially reducing the backup window and decreasing the system’s recovery point objectives (RPO) and recovery time objectives (RTO). Unlocking these settings is easy if one applies a paid VMware license. The minimum VMware licensing (VMware vSphere Essentials Kit) does that, and it gives the administrators all of the beauty of modern virtualization technologies, including ability to use Veeam Backup & Replication or Veeam Backup Free for VM data protection. Now, here's a quick Q&A round. Q: What if I use Veeam Backup & Replication (Veeam Backup Free) for free ESXi? Q: Ok. What about restore operations? Is that the same? A: Restore operations like Instant VM Recovery, entire VM restore and hard disks restore fail with the same error. However, the VM files restore operation works fine. It will gently upload files as if you were doing it via the vSphere datastore browser. When the operation is complete, you will need to go to the host and register the restored VM by right-clicking its VMX file and selecting add to inventory. At this point, the restored VM will be registered on the free host and you’ll be able to use it. This is a great tip if you want to play with a copy of your production VM at home. Q: I use free ESXi already, how can I protect VMs? A: There is always a workaround, and in this case, it’s not that complicated. You still can treat VMs working on a free ESXi like you would treat physical servers. For instance, install Veeam Endpoint Backup FREE inside of Windows guest OS, select the backup scope and schedule the job. Data residing on such VM will be fully protected and ready to be restored at your convenience. Q: What about my Linux VMs? A: As for the Linux VMs, you can use the manual VM export (turn VM off and copy VM files from ESXi datastore to your backup storage). However, we are going to have a new product that will make the things much easier here: Veeam Backup for Linux. We expect it to be available on the market soon. This product will take care of any Linux VM regardless of its nature (physical or virtual), allowing you to protect the data easily and efficiently. Q: Is there any other product helping me with free ESXi management? A: In addition to that, let me remind you that Veeam ONE Free Edition does support vSphere Hypervisor (free ESXi). With this instrument, you get powerful monitoring, reporting and capacity planning of your virtual infrastructure allowing you to prevent issues before they have any operation impact on the system. VMware developed powerful APIs for vSphere hosts, but they are only available with a paid license. As a third-party vendor, Veeam requires a licensed host to provide full ESXi backup and recovery support for 100% quality. The backup and recovery support also relies on VADP and its features. This is the only VM backup and recovery method VMware recommends, and it establishes differences between physical and virtual environments, which allows admin to take advantage of agentless backup solutions in virtual infrastructures. For small or branch office environments, check out the VMware vSphere Essentials Kit and the Veeam Backup Essentials bundle. I hope you found this post useful. Please leave your comments below or follow us on Twitter.